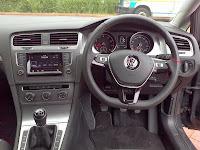 The test drive was provided by a colleague of mine, Ranvir Kallideen, who recently purchased the 1.2 TSI. This model is powered by a 1.2 litre turbo charge engine which produces 77kw of power and 175nm of torque and the power is delivered through a 6 speed manual gearbox, which is the only option you get. This engine was not only designed around fuel economy but also performance as well. Believe it or not this little engine is more than capable of pulling the weight of the Golf 7 body. Exterior is easy on the eyes, on this version you get 15" alloys standard but no colour coded mirrors and door handles. Therefore a darker colour option will suit this model better so as to camouflage this. 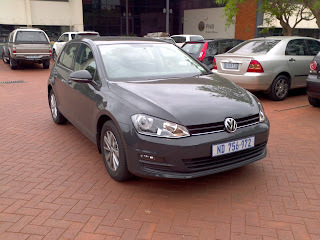 Like all the models in the Golf 7 range the 1.2 TSI is just as good looking as the rest. As you get into the car you can feel the quality in the finishes. 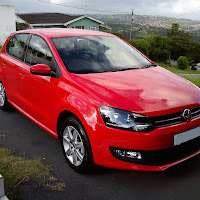 Although the 1.2 TSI only comes in a cloth finish, it is of very high quality. In this model the media radio is optional and I suggest taking it, due to the fact that it completes the console nicely and gives the car that quality exclusive feel. To add to that feeling, you also get a leather bound steering wheel with satellite controls. In fact, with the media radio, you won't know the difference between the 1.2 TSI and the 1.4 TSI comfortline. Besides the cloth interior the only other give away that it is the base model is the lack of rear electric powered windows. The 1.2 TSI comes with an electronic park brake, just like the one found in the 1.4 TSI. This also assists with launch control when you are taking off, the brake automatically releases when there is enough power applied to move forward. Bluemotion is also standard i.e. stop/start technology. Now getting to the interesting part that will convince most people to buy this car... and that is the 1.2 litre engine. From the word go you would not believe that this car is powered by a mere 1.2 litre engine, to put it into perspective, you used to get a 1.2 litre engine in a Fiat Uno, but the 1.2 TSI gives no hint that it's running a miniature power plant. On the road throttle response is excellent. If you wanted to do something, you just do it. There's no need to drop a gear or put you foot all the way down to overtake, just touch the accelerator a little bit more and it goes, effortlessly. We did our usual route to Sibaya and back, and this time I made it a point NOT to drive economically. After the trip I checked the average consumption and we did a ridiculous 6.1 l/100kms, so I'd say that you can achieve 5.0 l/100kms comfortably if driven economically. VW claims a combined cycle of 4.9 l/100kms. With regard to handling and comfort, VW got it right, again. Although this is the entry level vehicle in the Golf 7 range, the build quality, features and the sheer value for money makes the 1.2 TSI far from entry level. 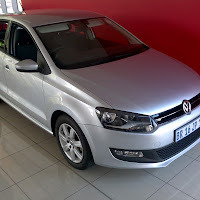 The VW Golf 7 1.2 TSI starts at R 246 300.00 (2013) and comes with a 5 year 90 000km service plan and 3 year 120 000km warranty. And I strongly suggest adding on the composition media radio as an extra, this in my opinion completes the deal.